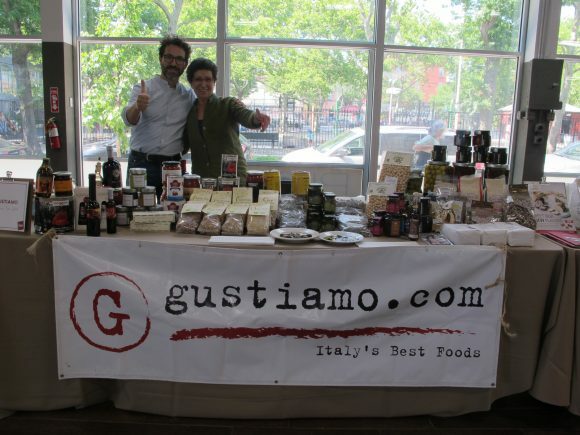 Gustiamo loves Sarah Weiner and the Good Food Foundation. We are very proud to have had the opportunity to be a sponsor of the Good Food Mercantile in Brooklyn. Beatrice and Gabriele, caper producer from La Nicchia. We admire the amazing work that Sarah does to foster a community of honest food makers. In fact, we were at the Mercantile with one of our favorite foodmakers, Gabriele Lasagni (lovingly called the caper dude) from La Nicchia in Pantelleria. Gabriele made sure everyone who walked through the doors of the Brooklyn Expo Center tried a caperberry (the best caperberries you have ever had). He was also interviewed by our friends at Heritage Radio. The Mercantile was an outpouring of good people and damn good food! We are so honored to have been a sponsor of this wonderful and important event.